Stockholm transportation director Jonas Eliasson has some advice for New York politicians worried about diving into congestion pricing: Just do it. It’s natural for politicians to feel squeamish about enacting a big policy change like congestion pricing. People who’ve grown used to free driving privileges defend them loudly, while the potential benefits feel diffuse and uncertain. That may explain why Mayor de Blasio hasn’t warmed to congestion pricing despite its promise to deliver a fairer, safer, greener, and more efficient transportation system. Stockholm transportation director Jonas Eliasson has some advice for New York officials worried about diving in: Just do it. 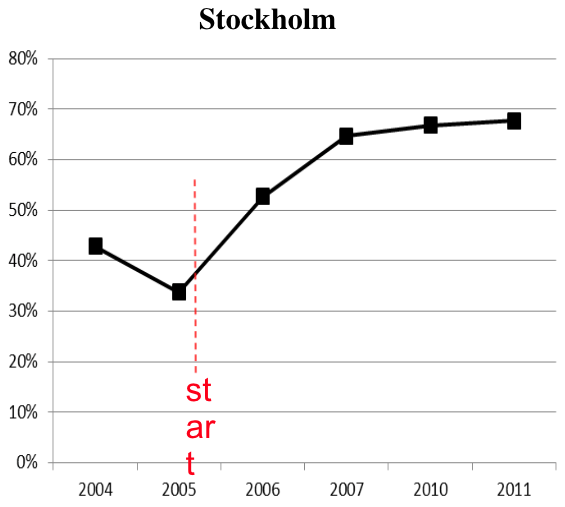 Eliasson steered the implementation of congestion pricing in Stockholm in 2006. From that vantage point, he watched a skeptical public quickly embrace the policy as soon as they saw it in action. Eliasson shared lessons from the city’s experience in a talk at TransitCenter last night. When Stockholm began charging drivers to access the city center, car trips across the cordon dropped 20 percent. Travel times improved immediately, and emissions fell. Contrary to doomsday predictions from Stockholm media and political opponents of congestion pricing, the policy was an overnight success. Before implementation, public support for congestion pricing had fallen below 40 percent. After a six-month trial period in 2006, more than 52 percent of Stockholm residents voted to make it permanent. By 2011, public support for road pricing stood at nearly 70 percent, and above 50 percent even among people who pay the fees most often. Pricing worked because the transportation planners who put it together prioritized systemic improvements for traffic and transit over the whims of elected officials and political parties. Getting the details of the pricing system right was too important to leave in the hands of politicians. If the policy passes in New York City, Eliasson thinks it could have a similar impact on transportation policy globally. The specifics of the forthcoming congestion pricing plan from Governor Cuomo have yet to be revealed, but the governor reportedly intends to introduce a plan in the 2018 state legislative session. Great article. But it barely hints at the breadth of Eliasson’s presentation and his hold on the overflow crowd. He was more scintillating, informative, optimistic, ebullient and charismatic than any traffic/transpo expert has a right to be. Clarence’s video interview w/ Eliasson, shot several years ago in Stockholm, gives a taste, but it’s (necessarily) rushed. Is there video of last night’s entire presentation? It would be great to get a link. Thanks Clarence. The first 45 seconds or so are an audio-visual mess but things straighten out after that, and the talk is marvelous. Sweden has decent wages for service workers. I’d guess their transit system is fairly safe for workers departing at midnight. I don’t think safety is the primary issue, it’s infrequent service at night. If you have to transfer, it takes forever to travel at 3am.